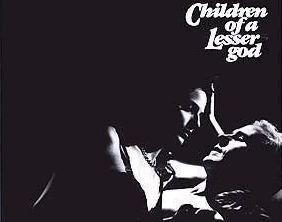 'Children of a Lesser God' was an outstanding success on Broadway in the late '70s and early '80s and was subsequently adapted into a popular movie with William Hurt in the leading role. The play won several awards including the prestigious Tony prize. 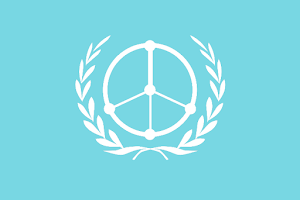 The play, which is told in retrospect from the perspective of the male protagonist, concerns a young speech therapist named James Leeds who joins the faculty of a school for the deaf in the U.S. after service overseas in the Peace Corps. He is idealistic and highly motivated as a teacher, but is confronted with an unexpected challenge as he falls for an ex-student and school dropout called Sarah. She resists the attempt to force lip-reading onto the students at the school and prefers to remain in her own world of communication which is mediated by sign language. The teachers are not competent in sign language so the students are expected to learn to lip-read and employ their residual hearing where possible. The play presents the struggle for recognition for the use of sign language by and for non-hearing people, which is becoming more accepted nowadays in a number of more advanced societies, where awareness of discrimination against those with hearing impairment has become apparent. Sarah and James fall in love gradually as James engages with her as a teacher and therapist, but as the play progresses Sarah becomes ever more militant in pursuit of the civil rights and respect which are not given to people who are hearing-impaired. She particularly resists attempts by hearing people and teachers to patronize, pity and impose their values and speech conventions on her and others like her. The play shows us that even love and understanding may not be enough to bridge the gulf between the hearing and the non-hearing world, but most importantly it portrays the human aspects of the situation and makes us realize that the differences are minimal in comparison to the human feelings and desires which unite rather than divide. A wonderful example of the genre of 'problem play', 'Children of a Lesser God' is a compelling and heart-warming drama as well as a highly thought-provoking modern classic. Play reading will be conducted in English.